Indicate your Pick Up and Drop Off locations, type of vehicle and your contact details. Our customer service operator will send you a message with an acceptable price for your trip via email. Or simply send us your quote request. Don't waste your time on planning and organizing the trip. You will be taken quickly and safely to the requested point of arrival. Our drivers are professionals with many years of passenger transportation experience. Our drivers are able to communicate in English, German, Russian and the other languages. We will pick you up at the place where you need, whether it be the airport, railway or bus station or any other area. 8rental Reservations is a company that really loves their business. We provide chauffeur services, minibus rental with driver & bus hire in Europe. Each employee of our friendly high-qualified stuff strives to make his contribution to every customer’s request. Goal. Our main goal is to provide a reliable passenger transportation solution at most reasonable & affordable price. Each trip is carefully organized by our staff manager: from the optimal route planning to the maximum price reduction for the customer. Safety and reliability at a reasonable price - this is the meaning of our work. Optimal price. Cheap coach hire & car with driver for rent. Our rates are the best for both hourly or transfer services. Booking with us you rest assured that you maximum optimized your budget for your trip. 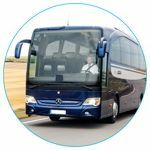 Looking for a company with the most affordable coach and driver hire prices? You have you found the right one! Safety and reliability. With many years of experience and hundreds trips in each city, we selected only reliable & experienced carriers and drivers. Each carrier has earned the respect on our part and on the part of each client. We work only with carriers who value their work, their experiences and each customer they serve. The intention to ensure the most comfortable and profitable travel to our customers has made us the leader in the car rental with driver & passenger transportation industry. Do not waste your time on endless searching of transportation companies. The best and most competitive carriers are our partners! Car & Minibus rental in Europe with driver. Minibus hire for Europe as well as for the rest of the world is probably most demanding service. 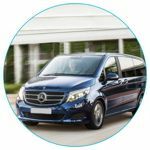 Renting our minibuses or cars with driver you can rest assured – you receive reliable and diligent drivers at best possible rates! For many years of experience we have built credibility as reliable partners. We value our reputation and approach competently to each trip organization, starting from route planning and price optimization to choosing the most reliable carrier for your journey. This is what has allowed us to grow to such an extent and enter the international market and make thousands of loyal customers! Do not waste time on searches. We are here to offer you a quality personal chauffeur service at best optimal price. Every day, in every corner of the world, there is a man who wants to visit a beautiful place full of world’s famous attractions, there is a businessman who flies to another country to sign a new contract, there is a great company of people who adores travelling. All these people have one thing in common – journey! Planning a trip, everyone wants to rest assured that in a foreign place, foreign city, foreign country they will be met & taken with comfort & safety to the desired destination. Customer’s safety and comfort is our company's primary mission. Often, we dream for years, plan our trip for months, but all our projects can be corrupted by unscrupulous transport companies who do not care about their customers, inflate the price to exorbitant level. Booking your chauffeured vehicle with 8Rental Company allows you to be confident in your trip. Our punctual driver will meet you and assist with your luggage, open the doors for you and your partners and make sure you feel comfortable & secure using our luxury chauffeur services. 8Rental’s fleet provides modern vehicles of world famous manufacturers, like Mercedes, BMW, Toyota, Ford, etc. Each car is clean, completely passed inspection, equipped with everything for safe trip. 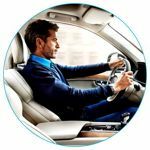 A professional driver with years of experience in passenger transportation sphere will take you to the desired location. Often, booking a car or minibus rental with driver services, people do not realize that the chain of the reservation consists of 3-4 brokers, Each broker makes 20% - 30% per trip. The cost of coach hire or car hire with driver is overcharged. Result – customer overpays 60%. Booking with us, you receive the price directly from the licensed carrier who owns the vehicle. Often transportation companies have bad attitude to their job, supplying cars with big delays. Cars are in poor condition; dirty interior; drivers drive aggressively, breaking the traffic rules putting the lives of passengers at risk. 8Rental only works with most reliable and trustworthy companies. Professional drivers, vehicles in perfect condition, safest modern car brands – this is 8Rental Reservations! Why it is not worthy to search for a chauffeured car by yourself? Are you looking for quality service at a reasonable price? Rent a car with driver in Europe with us! All carriers and drivers that you looking for are our partners! We are provided with big discounts from the carriers’ side. Being our customer, you receive the same discount for all your trips!